Capture the cloudless skies of a tropical holiday. Imagine a vibrant blue shawl or vivid bed spread. Such a brilliant shade will banish the winter blues or add brightness to a summer’s day. 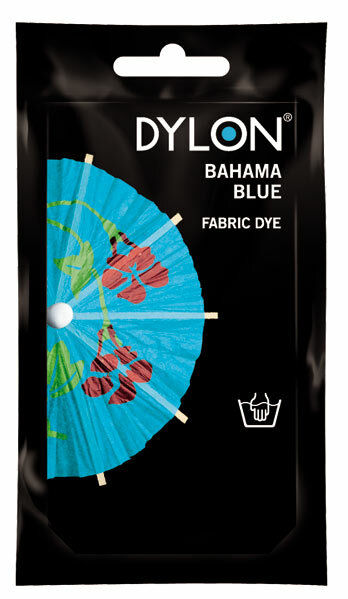 • Hand dye can be used in the microwave to create special effects. • For cotton, linen, silk and polyester/cotton mixes only. • Micro-Dyeing is not suitable for wool, viscose or synthetic fabrics. • DO NOT USE ON VISCOSE, AS FABRIC CAN GIVE OFF HARMFUL FUMES. • Remove all metal on fabric (zips, studs, etc). 1. Wash the fabric and leave damp. 2. Select your special effect and prepare the fabric by scrunching, knotting, twisting or folding - tie all fabrics tightly. 3. Wearing rubber gloves, empty the dye carefully into the bowl and gradually add 250 ml / ½ pint of hot water. Stir thoroughly to ensure dye is dissolved. Add further 250 ml / ½ pint of water. 4. Place the fabric in the bowl and work into the dye. 5. Put the bowl into a plastic bag or plastic wrap and place in the microwave. Set on ‘high’ for 4 minutes. 6. After 4 minutes remove the bowl from the oven - remember to protect your hands from the heat. 7. Tip away the dye solution and rinse the fabric in cold water. To protect the pattern do not undo any knots, twists, folds etc., until the water runs clear. 8. Rinse, wash and dry as for the Hand method.